This evening myself and Dan popped down to the river Wandte to continue our quest for the elusive Wandte barbel. 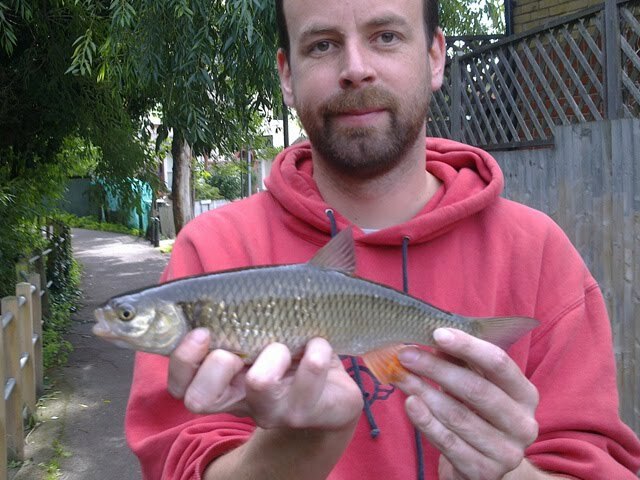 We started fishing a place called the hole which resulted in a chub about 10oz to me and a 12oz roach to Dan. 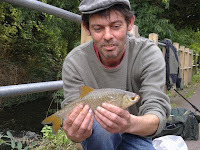 We moved to the weir and just as darkness fell I had a rod wrenching bite on ledgered worm, unfortunately the fish went under the weir and snapped me off. 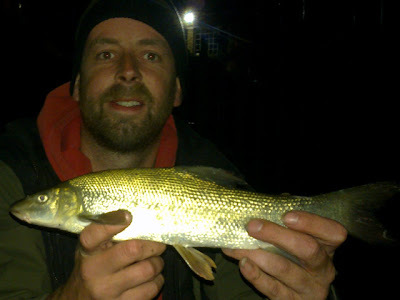 The next cast I used luncheon meat and it produced another fantastic bite, I landed an 8oz barbel, I had to double-check it with the torch, I had never seen a barbel this small and thought I might have caught a record breaking gudgeon! It was a barbel. Next it was Dan's turn, but he was broken off. While I was holding the torch for him to tackle back up my rod clattered towards the water, a running dive resulted in a rescued rod and a 1lb 3oz barbel (photo above), again to luncheon meat. Dan soon had another bite and a 1lb barbel, while I was on net duty my rod made a second break for the river, I managed to catch it and it's 12oz barbel culprit. 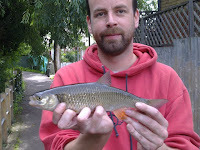 <- Dan's 12oz roach on worm, next time we are going to bring bread and see if we can find his 1lb+ bigger brother.